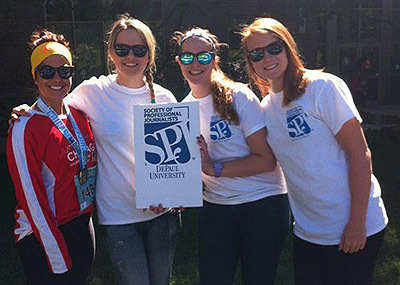 Posted byspjonadepaul	 August 27, 2012 September 22, 2012 Leave a comment on SPJ DePaul Membership Drive: Join Today! Our chapter had 63 members in it for 2011-12, making it one of the largest chapters in SPJ Region 5 (Illinois, Indiana and Kentucky). Our chapter was honored as the 2011 National and Region 5 chapter of the year, and has won many campus awards for its programming. 1) Go to this page on the SPJ national website. Register and pay online ($37.50 for national dues; $5 for SPJ DePaul). 2) Fill out this form and email it to SPJ DePaul adviser Mike Reilley at mreille1@depaul.edu. Once your national registration is processed — it takes about two weeks — and you’ve sent Reilley your completed form, you will receive a welcome email and be added to our contact email list for future events. In the meantime, make sure to follow us @spjdepaul for updates! 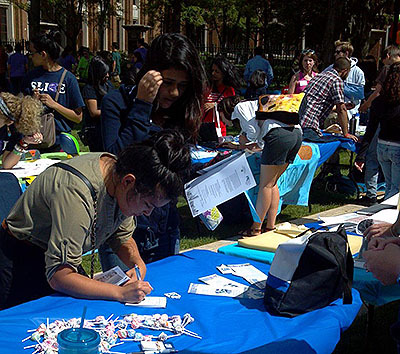 Members of SPJ DePaul’s exec board staffed our booth for the DePaul Involvement Fair.